Discover the three secrets to happiness--and much more--in the later years of life. How retiring at the wrong time increases the likelihood of dying 89%. What can delay Alzheimer's onset an average of 9 years. How everything that makes you happy comes in just 3 forms. ERIC THURMAN has a history of blazing trails. He was one of the early leaders of the microfinance movement, heading anti-poverty programs in 30 less developed nations. Now, driven by personal passion to find both meaning and enjoyment during his later life, he is creating a new path for people who also want to thrive during the last third of their life. Thurman began his career as a broadcast journalist and has extensive media experience. A partial list of his coverage or appearances include: CNN, Fox and Friends, Wall Street Week, PBS, CBS News, Newsweek, Time, Harvard International Review, CNBC TV, Forbes, Christianity Today, The 700 Club, Financial Times, and The Economist. Thurman and his wife, Diane, reside in Illinois. 1. What in your life caused you to explore what it means to thrive following retirement? When I turned 65, all was going smoothly. My wife and I had been together for over 40 years. I was leading a program for troubled children that I found enormously meaningful, and the organization had asked for my 10-year plan. I imagined that I could delay thinking about retirement for years. Little did I know that a year later, my wife would die from cancer and my career would come to an abrupt end. I realized soon after that I had a choice: either give up on life or find a whole new way of living. 2. What are you seeing among other retirees that made you feel there was a need for this advice? I meet too many older adults who are seriously dissatisfied. They have bought into the popular myth that retirement should be just one long, endless vacation. However, rather than being entertained and satisfied, they find themselves disappointed, directionless, bored, and often lonely. 3. Is retirement all about financial planning and 401Ks? Where do you think we get it wrong? Finances certainly matter. However, we all know of famously wealthy people who are severely unhappy. After all, there’s more to life than money. Finances are only one of the five key areas of life. All five parts of life need to be strong and healthy for a person to be truly happy. 4. What do you think are the key components to living with vitality at any age? What everyone needs to be fully happy is to be robust in each of the three P’s: Purpose, Pleasure, and Peace. You reach your greatest happiness when your life has meaning (Purpose). You discover ways to enjoy life deeply, more than just a momentary fun (Pleasure). You have a sense of well-being. You are free of fear and worry (Peace). These principles of happiness are, indeed, the same at all ages. What changes as you grow older is how you apply those principles. A young man may find basketball with friends a great source of recreation. Decades later, his idea for outdoor recreation with friends may shift to fishing. The principle of recreation being good for you remains the same. The way you act it out changes depending on your stage of life. 5. You teach that purpose plays an important role in this phase of life. What have you discovered about your purpose? How has it changed you? Purpose, pleasure, and peace are the building blocks of happiness. Purpose is far and away the strongest of the three. In the last few weeks before she died, my wife and I recognized how it was one of the best times we’d had together. We were at peace, though it was hardly a peaceful situation. We felt the pleasure of belonging to each other and trying to make the most of our last days together. What made the difficult time good was that my wife, our adult children, and I all knew that pulling toward each other and caring for her was the most important thing we could do. It filled those final days with purpose and sits as a good memory even as we grieve losing her. 6. What is your motto for success and why is it meaningful to you? I have a short phrase that I say to myself often: I want to be ready to die tomorrow, yet also able to thrive if I live to age 100. Ready to die tomorrow means that I am not leaving a mess of my personal affairs for my loved ones to sort out after I die. It also means that I am trying to mend or settle broken relationships rather than leaving them to fester. The chances of living to age 100 are actually quite good. In fact, centenarians are the fastest-growing population group. Realizing that I could have decades still ahead of me motivates me to learn new ways to be happy and have meaning in my life. One way that I pursue God’s wisdom for my life is to think about the number of my days. That allows me to be ready to die tomorrow, and at the same time prepared to live well and abundantly until age 100 if God permits me that many years. 7. What role does your faith play in thriving at this stage of your life? Is there anything in that verse that even hints that there could be a time limit on God’s design of what he “prepared in advance for me to do”? We shouldn’t buy into the popular notion that when you retire, you stop work and other responsibilities in favor of relaxing and playing all the time. Our lives do not have a “best by” date. God has not said that his plans are only usable if they are accomplished by the age of 65. One of the best parts of being a servant of Jesus is that he continues to have meaningful ways to use me. I’m staying engaged with God’s work and loving it. 8. What does research tell us about the benefits of belonging to a faith community? Major universities, including MIT and Harvard, are conducting studies that show significant benefits that derive from certain faith practices. While collecting data for Thrive in Retirement, I interviewed Dr. Tyler J. VanderWeele at Harvard. He combs through what may be the most extensive collection of data so far on aging. What he found was that when someone not only has personal faith, but also participates in church at least once a week, there are significant, measurable effects. People with active faith, for instance, who also have common health struggles like heart disease or breast cancer, show a 25% higher survival rate after a few years. Other notable benefits among believers who participate regularly in church include less depression, lower suicide rates, less divorce, increased ability to have friends, and a greater sense of meaning and satisfaction in life. In summary, Harvard’s statistics show that people of faith have a reduced risk of dying over a fifteen-year period. 9. Why is retirement a difficult transition for many people? Most people underestimate how big the changes will be during their retirement years. With the expectation that you will live 20 to 30 years after you stop working, know that you will experience many changes during that time. Think back to a similar length of time earlier in your life. Take the 20 years you lived between ages 30 and 50 for instance. Were there many changes during that span? In the same way, expect a host of new experiences during your next 20 or 30 years. 10. Is there a right or wrong way to retire? There are many ways you can improve your retirement years and also plenty of wrong turns you can take. Here’s an example of a wrong turn that may surprise you: taking early retirement can be deadly! In a 30-year study of all Shell Oil Company employees who worked there between 1973 and 2003, it was discovered that people who retired at age 55 were 89% more likely to die within a decade than those who retired at 65. Thrive in Retirement cites dozens of additional studies about what affects both longevity and quality of life. 11. Is there something that makes retirement a bigger issue today than in the past? In the 1800s, most people died in their 40s. Thus, we are living decades longer than our ancestors. How to spend one’s later years wasn’t much of a question two or three generations ago, because people didn’t live long and those who did often weren’t in good health. These days, longevity is much higher and our extra years are generally healthy and active. The challenge is to use your extra years well and enjoy them. 12. How can you tell that current habits around retirement aren’t working? Multiple indicators show that a large percentage of older adults are finding retirement not to be the panacea of a carefree life they dreamed of having. Divorce rates among older couples have doubled in recent years. Rates of suicide and drug abuse are rising. These are not problems just among young people. These tragedies are increasingly common among older adults. Loneliness has become such a problem that the surgeon general of the United States has issued an official epidemic declaration for loneliness. Forty percent of older adults are not just a little lonely; they are clinically depressed. As evidence of the extent of isolation among older adults, it is becoming common not to have a funeral when someone dies. "Whether you are thirty, fifty, or eighty years old, its not too late to take Eric Thurmans advice for a happy, healthy, and secure retirement. With the secrets he offers in Thrive in Retirement, you can enjoy what many of us feel are the best years of our lives! Thank you, Eric, for writing such a great road map!" "Leaving my long executive career was a big change. Thrive in Retirement is a candid and well-researched wealth of information and encouragement on how to not only navigate but thrive in the great third season of my life." "As retirement nears, we encourage older adults to plan for their future ﬁnancial or health care needs, but what Eric Thurman insightfully notes is that we often overlook the need to plan for what will make us happy. I encourage older adults to use this book as their guide to happiness." "Retirement is more than having enough money saved. It is making sure that your finances are taken care of while also planning what to do in your free time, identifying what your passions are, and deciding how you are going to execute those plans after you retire. Erics book has it all. I give it to my clients of all ages&hellip;to think about as they plan for retirement. Eric, thank you for writing what I think is the comprehensive manual to a happy and prosperous retirement!" "What a wonderful guide for successful aging! In a culture that values youthfulness, this book shows us we dont have to buy into the stereotypes of growing older. Having worked in the field of aging for over twenty-five years, I found Eric Thurmans book to be insightful, poignant, uplifting, and practical. As our nation is on the cusp of experiencing the silver tsunami, this is a must readespecially for anyone of the baby boom generation." "Grounded in much insight, Thrive in Retirement is a practical guide to anyone in retirement or considering it. I think everyone over fifty should read it. The book really helps people reﬂect on their lives and live more purposefully, longer, and happier!" "I love adventure, not just in comics, but also in real life. I dont want my life to be boring, sad, or lack for meaning. Life is meant to be overflowing. I love to use all my potential, not just in my drawings but also in my ministries and leisure times. I expect to enjoy all the years God gives me. Thats why I love Thrive in Retirement. It has a wealth of information on how to make the most of all my decades ahead." "Psalm 92 shares that Gods people will prosper and be like trees that stay healthy and fruitful, even in old age. I encourage you to read Thrive in Retirement, to consider and apply what Eric Thurman shares about abundant living in your later years and finishing this life well." "In over thirty years of psychiatric care with older adults, we find that social isolation and lack of meaningful activity are common risk factors. As we age, it is how we nurture our relationships and build meaning in our souls that makes the difference between just surviving and truly thriving." "Thrive in Retirement is a must-read. I found the practical applications in the book to be most helpful, including the online information and especially the checklists. I laugh that even though as a judge and a lawyer I am familiar with many of the checklists, I believe those in the book are very thorough, and I had not considered some of the personal lists." "We have not stopped hearing from our congregation since we held a workshop around this book. We had double the usual number sign up. The information is highly engaging, practical, and challenging. It has been a true game changer for our people." 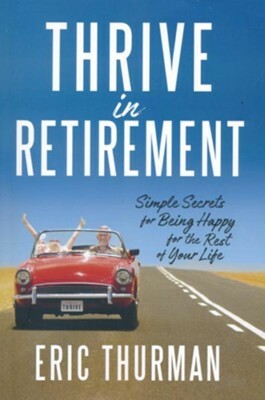 "Having just retired at eighty, after reading Thrive in Retirement, Im reconsidering! The book is challenging, provocative, insightful, practical, and provides hope for a productive future. I want to grow old as Eric suggests, not merely become old." "This part of life is a big jump and anxiety producing for a lot of people. At the very least, it can be confusing. Thrive in Retirement provides a really nice transition because it is entertaining to read, chock full of information, and very practical." "Eric gives invaluable information and advice in this book. I have implemented things he wrote to improve my own retirement." "This book is your pathway to being fulfilled and happy in every step of your lifes journey." "Eric doesnt just write about how to flourish in retirement, he shows us how. In Thrive in Retirement, Eric shares from his own life experience to help us make the most of the time we are given. You will be inspired to thrive in this season with rekindled clarity and purpose." "As someone who has dedicated his life to empowering corporate leaders to unleash the creativity, intelligence, and worth of their employees, I commend Eric Thurman for masterfully carving out a game plan for vital, postretirement yearsyears that he demonstrates can be entirely productive and fulﬁlling. In Thrive in Retirement, Eric has written a book that might also be called The Best Years of Our Lives!" "Eric Thurman has written a masterful book for older adults who seek to make their years beyond retirement the most fulfilling, creative, and happy time of their lives. A great humanitarian who has enriched the poorest of the poor in developing countries, Eric is now in service to enriching the lives of those hardworking people whose best and most joy-filled days may lie ahead of them!" "Thrive in Retirement provides a clear and compelling case for embracing the third season of our lives with purpose and gusto! Although ﬁnancial health typically comes to mind for people facing retirement, Thurman skillfully advises us on the power of purpose, pleasure, and peace to fill us with lasting happiness." "Eric Thurman has written a book that touches every [retirement] subject you may be interested in knowing more about. Its written in a way that keeps your attention, and it gives hope for our future and tips about how we should view the aging process. I love the word thrive in the title. You may think and feel your age, but this book will give you a new way to think about the truth. Think more about "thriving" and less about "dying" because what we think adds life to our living." I'm the author/artist and I want to review Thrive in Retirement: Simple Secrets for Being Happy for the Rest of Your Life.